There is nothing better than waking up before the kids and enjoying a cup of steaming coffee with my husband on the porch. Winchell Mountain Coffee is a family-owned coffee roaster from the Catskill region in New York that takes coffee to new levels with artisanal blends that taste absolutely delicious…..the perfect cup of coffee! I love that they are passionate about brewing the perfect coffee using Old World technique using the freshest, highest quality beans and roasting using heat and hands. Winchell Mountain Coffee is thrilled to partner with talented artist, cartoonist and author Sandra Boynton to bring whimsy and style to the coffee packaging with fun characters and creative names. I can’t help but smile at the adorable rooster with a cup of coffee on the “Wide Awake” varietal. The simple expression on the fowl’s face is priceless and the bold, zesty premium coffee is wonderful. All of the delightful characters in this collection match the coffee perfectly and really captures the spirit of Sandra Boynton’s talented works. My favorite is the limited edition, “Valentine’s Day: An Affectionate Blend” which features a Viennese roast. The aroma is intoxicating and it tastes as great as it smells. My husband and I really enjoyed this brew and I plan to stock up before it is gone. 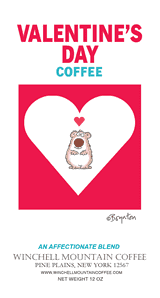 You are invited to visit the Winchell Mountain Coffee website to check out all of the fabulous coffees featured in the Sandra Boynton collection and purchase your favorites. 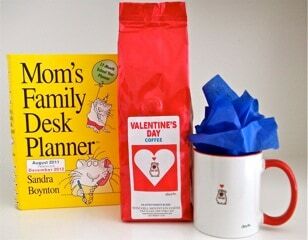 One lucky reader will receive a Valentine’s Day prize pack from Winchell Mountain Coffee including: the Valentine’s Blend Coffee, a coordinating Sandra Boynton coffee mug and the 2012 Moms Family Desk Planner! I would like to try the Birthday Blend. Not a Morning Person blend suits me to a t.
I would go with the country morning blend or the evening coffee blend! I would like to try the wide awake blend. I’d try the All Nighter coffee. I would really like to try the Beach Bum blend….mellow with just a hint of chocolate. 🙂 Thank you. I would like to try the Evening Coffee. The Beach Blend sounds pretty good. Would love to try Overdrive Espresso! I would like to try the Perfect Harmony. I would love to try the Overdrive Espresso. I would love to try the Birthday blend. I’d like to try Evening Coffee. The Country Morning coffee sounds good to me. Thanks for having this contest! I would like the birthday blend. I’d love to try their Birthday Blend! I would love to try the Beach Blend.